After six weeks of gains I feel like a bettor at the craps table. In the game of craps, when you win certain bets, you can press your bet. That means if you had $25 bet and you won $50 you can keep $25 and add $25 to the original bet. You now have $50 in play and $25 in your pocket. If you win again you could press your bet again by keeping $75 of your $100 in winnings and adding another $25 to your bet. Note that I am using simple dollar amounts for the example so non-bettors can understand. Since they don't build those billion-dollar hotels in Vegas on tips from winners, there is a flaw in this process. In craps, once a number is rolled the object of the game is to roll that number again before you roll a seven. The seven is the killer number and there are 6 ways to roll a seven making it more likely to appear than any other number. The odds are always against the shooter. Gamblers who constantly press their bets are eventually stopped out when a seven appears and all number bets lose. This is why smart gamblers stop pressing their bets and take their money off the table after a series of successful rolls. Regardless of how lucky you are, at some point the seven will always appear and the dealers will scrape all your hard-earned money off the table. It may take 5 rolls or 50 rolls but a seven always appears eventually. The longest recorded streak was set by Patricia Demauro at the Borgata in Atlantic City where she held the dice for four hours and 18 minutes without a seven out. She rolled the dice 154 times. It was only her second time playing craps and she started with $100. The Borgata would not say how much she won but they escorted her to her car with her winnings after providing a champagne toast for everyone at the table. The previous record was three hours and 6 minutes in a Vegas casino. The Dow and Nasdaq have been up for six consecutive weeks. Rarely do the indexes post long consecutive winning streaks. They do happen and I will be the first to admit I have lost a lot of money betting against them. They are so rare that once they appear, supposedly "knowledgeable" analysts begin calling for profit taking after the first 5-6 weeks. To continue the gaming analogy, if you are playing roulette and a red number comes up 6 times in a row, most gamblers would start betting on black under the assumption that the next number will be black. In roulette there are 18 reds, 18 blacks and 2 greens. That means there is less than a 50% chance the next number will be red again. I have seen gamblers throw thousands of dollars on the table after a long string of red or black numbers because they are sure the string will be broken. However, the roulette wheel has no memory and it does not know the last 10 spins ended resulted in a red number. In Mesquite Nevada several years ago, I saw a run of 21 consecutive spins with a black number. Tens of thousands of dollars were wagered and lost on the idea a red number would appear on the next spin. The odds of a single color appearing for 20 consecutive spins are 1,813,778 to 1. The longest recorded streak in American casino history was in 1943 when red hit 32 consecutive times. Fortunately, the market itself may not have a memory but millions of investors have vivid memories of prior resistance levels and support points. These investors have a much better chance of making money betting on reversals at these levels than they would on craps or roulette. This reduces the likelihood of a continued streak of market gains. It can happen but investors entering new positions today are "pressing" their luck. The market is driven by headlines and expectations that impact investor sentiment. Today that sentiment is being powered by expectations for a trade deal with China. Like everyone betting on a red number in the example above, investors have done the political math and expect a deal by the end of February. These expectations could keep the markets positive for the next couple weeks but could set us up for a big letdown if everything in the agreement is not perfect or for some reason an agreement is not reached. Investors should not be pressing their bets at this point in the market cycle. This is time to be reducing those bets or maintaining trailing stops to capture profits should something unexpected happen. You only need to look at the change in the A/D line on the S&P since Christmas to understand the current overbought conditions. 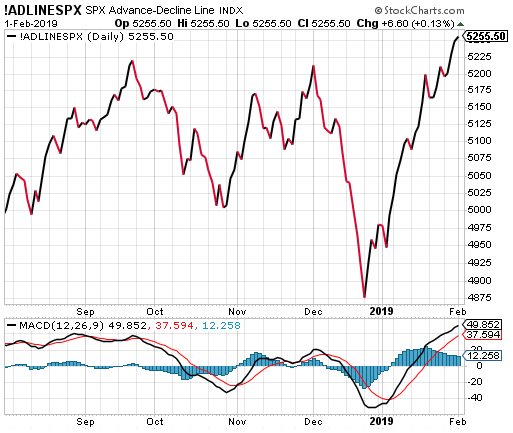 Six weeks after the Christmas lows and the A/D is at a new high. Obviously, it can go higher but we are rapidly approaching a point where post earnings depression is going to impact sentiment. Post earnings depression appears when traders buy/own a stock ahead of earnings. They are looking for a big earnings beat and a post earnings spike. Regardless of what the company reports there is rarely a continued move higher 2-3 days after earnings. This may occur in 2-3 out of 100 earnings reporters. We see it all the time. Company ABC beats on earnings and revenue and issues positive guidance. Shares rise and traders take profits. Shares decline in the weeks following the earnings. This is the depression period where traders are moving their money to another stock to capitalize on their earnings run. This is the perfect scenario. In the majority of reports the company may beat on one or two of the metrics but they miss on the other. The stock falls at the open and trader flight is instant. However, in this scenario, investors rather than traders, begin to decide they want to move their money because of which ever combination of metrics that produced the disappointment. If they company disappointed on guidance, then why continue to hold the stock? The investor flight is not instant but will occur over the next several weeks because of changing investor sentiment. February is a bad month for post earnings depression. The fourth quarter is normally the biggest earnings quarter of the year. Those earnings color guidance for the next year. If companies disappoint after the best quarter of the year, then investor sentiment sours quickly. Since 1950 February has posted 39 gains and 30 losses. The loss years posted larger percentage moves then the up years. The average gain or loss over the last ten years is 4.1%. Only one year was flat at 0.24% and the biggest move was a -10.7% loss. This suggests we should expect a 4% move in February only we do not know which direction. The expectations for a China trade deal could keep the market positive unless the Q1 earnings forecasts continue to plunge deep into negative territory. On the positive side, the semiconductor stocks are surging. 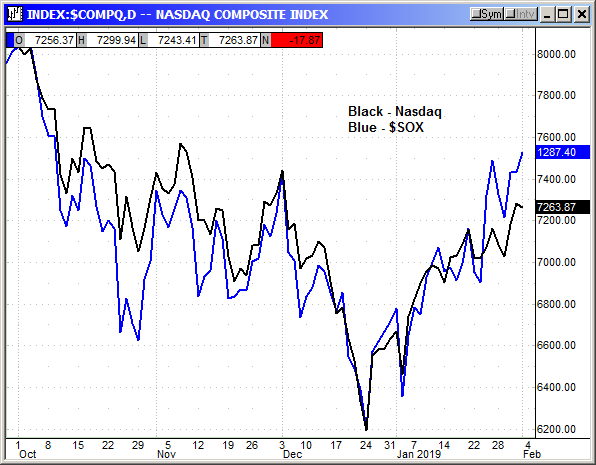 That is positive for the Nasdaq and assuming GOOGL earnings on Monday do not tank the tech sector, the Nasdaq should continue higher. Also positive is the correlation between the small caps and the Dow. The small caps normally lead the market, especially in January. They have recovered nicely but they are not yet leading. We need them to take their leadership position and that would be very positive for market sentiment. Small cap earnings begin this week but will increase in intensity the following week. 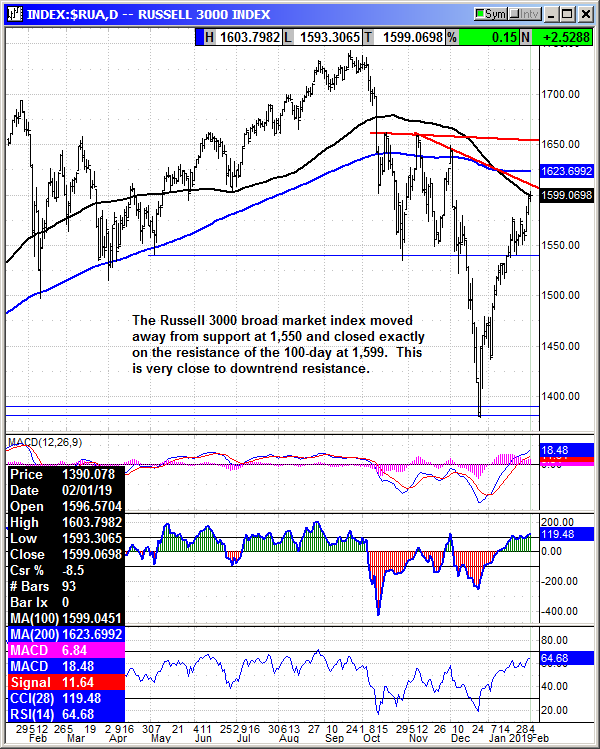 The Russell 3000 never fell back below that initial support at 1,550 and has continued higher to stop exactly on resistance of the 100-day average at 1,599 on Friday. This IS the market in one chart. The index faces downtrend resistance just over 1,600 and then the 200-day at 1,623. As long as the R3K continues to move higher the smaller indexes, Dow, S&P, etc, will eventually follow. 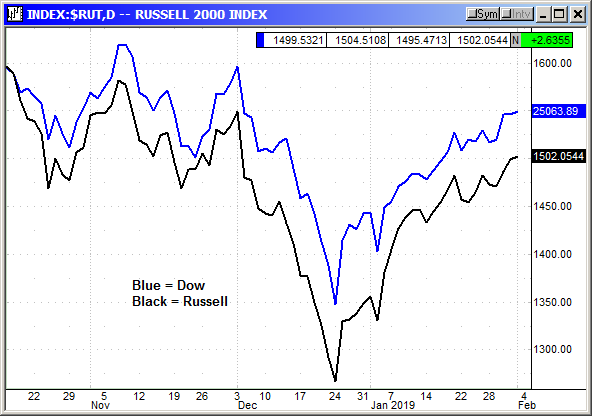 The smaller indexes will be more volatile because of individual issues but as long as investors continue buying the broader market, we will be ok. I am not recommending anybody sell anything. I am only supplying a cautionary view that market streaks do not last forever and that is especially true in the current economic and political environment. Add some trailing stop losses, fasten your seatbelt and be prepared for some turbulence in the weeks after the China trade meeting at the end of February.